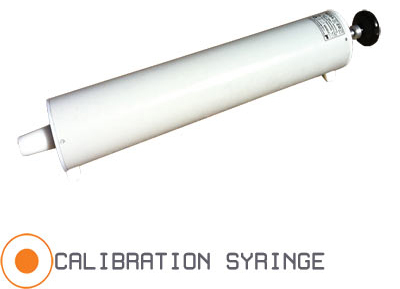 The AME Calibration syringes are built to the highest specification by our skilled engineering team. Use: The AME 3 litre Calibration Syringe is specifically designed for the calibration of Spirometry equipment. The syringe is designed to push or pull 3 litres of air (within 0.5% of 3 litres as per ATS specifications) with a full stroke from end stop to end stop. The syringe consists of a robust aluminium cylinder, piston, end caps, stroke termination collars and push rod. Aluminium: 3 mm thick seamless extruded 97.5mm inside diameter aluminium cylinder. Piston: 2 plunger cups (one for each direction) injection moulded from Thermo Plastic Rubber XK70 AP3001 with a hardness of 70 Shore A. The rubber cups fit the aluminium inside diameter and are sized to be self sprung outwards (soft pressure fit) so as to ensure an air tight fit without too much friction during stroke. The rubber cups are designed to increase force to the cylinder wall with increasing air pressure. This helps to prevent air leakage past the piston. The piston has a polypropanyl disk (1mm less than the aluminium cylinder diameter) fitted between the 2 cups as a guide to prevent rocking of the plunger rod and to protect the cups from severe vertical forces and permanent deformation while standing or in storage. The disk can make a slight scraping sound when the syringe is operated - this is normal. The syringe is able to perform without sticking at very low flow rates due to the unique rubber cups. End Caps: Automatically machined from High Impact Polyethylene. Designed to withstand high impact forces from high velocity strokes terminating on the end cap without instantaneous deformation of the cap by more than 0.1mm. The thick, machined end caps are much stronger than thin injection moulded end caps. The Nozzle end cap can be machined to any shape or size to fit different Spirometers on request. The standard size nozzle is designed to fit a cardboard mouthpiece which may be connected between the Syringe nozzle and the Spirometer. Physical Damage: The syringe must not be dropped onto hard surfaces or dented. Care must be taken not to let objects fall onto the Aluminium cylinder. The aluminium cylinder must not be subjected to any blows etc. Lubrication: Only lubricate with Q8 Silicone Spray available from most hardware shops. Q8 is a dry silicone that contain no oil. Oil based lubricant will cause the piston to stick during low speed strokes. Silicone lubricant Application: With the piston pulled out as far away from the nozzle as possible, spray a couple of short bursts of Q8 into the syringe nozzle. This should ensure a smooth operation after a couple of strokes. Don’t use too much silicone as it will just run out of the syringe. Leak Test: Cover the nozzle with the hand and push/pull on the plunger handle. There should be no obvious leak. If the rubber cups leak then cover the nozzle with the hand and force the handle to create some pressure. This will force the rubber cups to expand to the inner circumference of the aluminium cylinder. Storage: Don’t let the syringe stay exposed to the sun or any other potential heat source as this may soften the rubber cups resulting in permanent deformation and possible air leakage past the rubber cups/piston. Connection to the Spirometer: It is always best to fit a bacterial filter between the nozzle and the spirometer. This helps to preven ‘directional’ flow that may impinge on a pressure transducer port. The filter acts as a laminar flow element and will disperse the air flow evenly into the Spirometer flow tube. Always push and pull the syringe until the plunger termination collars strike the end cap in both directions. This will ensure that the full 3litres of air has been pushed out (or pulled into) the syringe. If strokes are not conducted fully from end to end the Spirometer will not be calibrated correctly as the Spirometer software thinks it is getting 3 litres to calculate a new calibration. components or to a local material recycler. 100% of the syringe can be recycled.